english name "Chilean Orange Dust Amanita"
2. Amanita aurantiovelata, from Southern Beech (Nothofagus) forest, Andean Chile. 3. Amanita aurantiovelata, from Southern Beech (Nothofagus) forest, Andean Chile. 4. Amanita aurantiovelata, from Southern Beech (Nothofagus) forest, Andean Chile. cap The cap of Amanita aurantiovelata is up to 45 mm wide, semiglobose when young, convex when older, with umbo, deep orange to red-orange when young, fading to orange or orange yellow and pale yellow later, at first felted and mat, later smooth and shiny, with a sulcate-striate margin. The volval remnants are fragile, deep orange, in slenderly conic warts with pallescent tips in the beginning, then later glabrous. 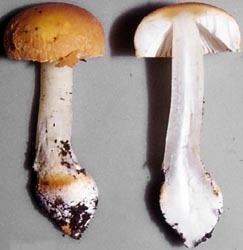 gills Gills are free, moderately crowded, white to whitish, and often have a frimbriate edge, especially near the stem. Short gills are scarce. stem Its stem is up to 75 × 10 - 12 mm, clavate when young to almost cylindrical with approximately pointed bulbous base with age, solid, exannulate, white to pale yellow, somewhat pulverulent, with deep orange, floccose volval remnants at the base and on the top of the stem''s bulb. spores The spores of this species measure (8.8-) 9.0 - 12.0 (-12.6) × (6.0-) 6.4 - 7.6 (-9.0) µm, and are broadly ellipsoid to ellipsoid and inamyloid. Clamps are present at bases of basidia. 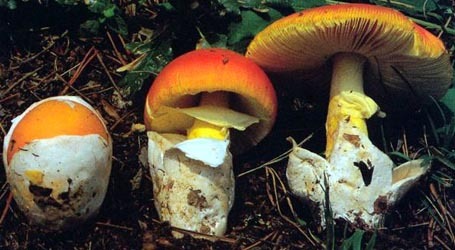 Amanita auranitovelata was originally described from Chile in association with Nothofagus. It is locally quite common in the coastal and Andean cordilleras as well as in the valley between the ranges. author Schalkw. & G. M. Jansen. 1982. Persoonia 11: 515, fig. 1(a-f). =Amanita gayana sensu Singer. 1969. Beih. Nova Hedwigia 29: 151.
non Amanita gayana (Mont.) Mont. in Gay nom. dub. etymology aurantius, orange + velatus, veiled; hence referencing the orange universal veil. The following material not directly from the protolog of the present taxon and related materials such as unpublished photographs or from another cited source is based on collections, photographs and field notes of Dr. Egon Horak and other original research of R. E. Tulloss. pileus protolog: up to 45 mm wide, semiglobose when young, convex when older, deep orange to red-orange when young, fading to orange or orange-yellow (4-5A6), pale yellow at margin, not umbonate, at first appearing felted, eventually shiny; context pale yellow below pileipellis, otherwise, white; margin at first slightly sulcate, later strongly sulcate-striate, nonappendiculate; universal veil as up to 2 mm high warts, fragile, deep orange (6A8), slenderly conic, pulverulent, with pallescent tips, detersile; pileipellis easily peeling for two-thirds of radius. lamellae protolog: free, moderately crowded, white, with some edges fimbriate especially near stipe; lamellulae scarce. RET: free, moderately crowded, white, with some edges fimbriate especially near stipe; lamellulae scarce (not observedyet?? in material examined). 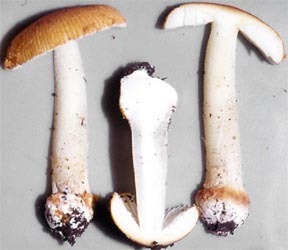 stipe protolog: up to 75 × 12+ mm, pale yellow (2A4), at first narrowing upward, later nearly cylindric, somewhat pulverulent (sometimes with superior pulverulent zone); bulb up to 22 mm wide, with or without slightly rooting pointed base, proportionately broadest when young; context white, solid; exannulate; universal veil friable, floccose, deep orange, on base of stipe or bulb. RET: up to 75 × 12+ mm, pale yellow (2A4), at first narrowing upward, later nearly cylindric, somewhat pulverulent (sometimes with superior pulverulent zone); bulb up to 22 mm wide, with or without slightly rooting pointed base, proportionately broadest when young; context white, solid; exannulate; universal veil friable, floccose, deep orange, predominantly remaining on bottom 1–2 cm of stipe base and on bulb above its broadest part. odor/taste protolog: Odor indistinct. Taste mild. Inedible according to Garrido-G. (1985). lamella trama protolog: "approximately bilateral." basidia protolog: 35 - 65 × 7.0 - 14.0 µm, 4-sterigmate; clamps present. 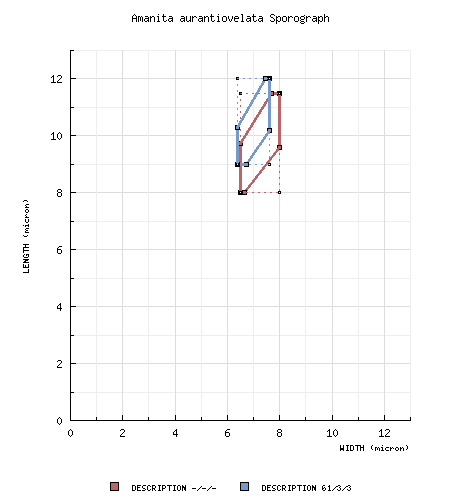 RET: 35 - 65 × 7.0 - 14.0 µm, dominantly 4-, also 5- and 3-sterigmate, with sterigmata up to ?? × ?? µm; clamps frequent. universal veil protolog: On pileus: with all elements near disc arranged anticlinally; filamentous hyphae 5.0 - 12.0 μm wide, branching; inflated cells subglobose to ellipsoid to pyriform, yellowish, thin-walled, 20 - 65 × 18.0 - 37 μm, in terminal in chains of 4 - 6 cells (without exception). On stipe base: filamentous hyphae 2.5 - 6.0 μm wide, branching, very abundant, "somewhat encrusted"; inflated cells often large (up to 175 × 80 μm), terminal, singly or in short chains. stipe context protolog: longitudinally acrophysalidic; filamentous hyphae 2.5 - 6.0 μm wide, sparsely branching; acrophysalides up to 200 × 35 μm. lamella edge tissue protolog: filamentous hyphae present as relatively short and sometimes branching segments; inflated cells terminal singly or in chains, globose to ellipsoid to elongate or irregular 9.0 - 45 × 10.0 - 25 μm. RET: sterile. protolog: [-/-/-] 8.0 - 11.5 × 6.5 - 8.0 μm, (Q = 1.20 - 1.50 (-1.65); est. Q' = 1.35), hyaline, colorless, smooth, thin-walled, inamyloid, broadly ellipsoid to ellipsoid, rarely elongate, adaxially flattened (per illustrations); apiculus sublateral (per illustrations), "sometimes truncate," "broad"; contents not recorded; white in deposit. RET: [61/3/3] (8.8–) 9.0–12.0 (–12.6) × (6.0–) 6.4–7.6 (–9.0) µm, (L = 9.6–11.0 µm; L' = 10.2 µm; W = 6.8–7.4 µm; W' = 7.0 µm; Q = (1.28–) 1.34–1.61 (–1.69); Q = 1.40–1.50; Q' = 1.46), hyaline, colorless, thin-walled, smooth, inamyloid, adaxially flattened, ellipsoid to occasionally elongate; apiculus sublateral, proprotionately large and markedly projecting, cylindric to truncate-conic; contents dominantly monoguttulate with additional small granules; white in deposit. ecology protolog: Chile: Solitary. Under Nothofagus obliqua. With regard to additional research in Chile, Valenzuela et al. (1999) report that this species was not present in the Nothofagus forests studied in the Cordillera de la Costa and the Cordillera de los Andes; however, it was a common species in forest of the Depresión Intermedia—occurring there with N. dombeyi, N. obliqua, and other unidentified Nothofagus species. material examined protolog: CHILE: LOS LAGOS—30 km W of Osorno, Cuinco [40.6417° S/ 73.4417° W], 3.vi.1979 Jansen & Schalkwijk XVI-251 (holotype, L). RET: CHILE: BÍO BÍO—Curanilahue, Trongol Bajo, 32.v.1982 N. Garrido-G. 519 (M n.v., ZT (Horak)). LOS LAGOS—Valdivia, Elvira, Cuesta Sta., 14.v.1967 R. Singer M6889 (SGO n.v.), 15.v.1967 R. Singer M6912 (SGO n.v.), 8.iv.1975 E. Horak 75/280 (ZT (Horak)); Rebellín, 18.v.1990 E. Valenzuela & J. Grinsbergs s.n. (AH 13911 n.v., ZT (Horak) 5161). 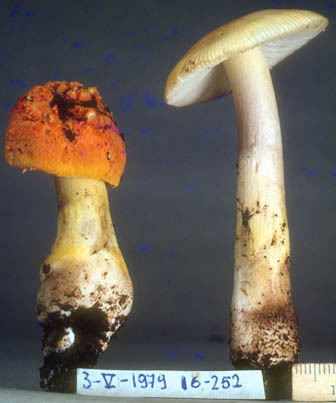 discussion In the protolog, the authors compared the present species to others of section Amanita with an exannulate stipe, colored universal veil, and spores of comparable size and shape. In the process, they pointed out siginificant differences segregating their new species from A. mira, A. rubrovolvata, and A. wellsii. The reader may also wish to compare the present species with A. cruzii and A. roseitincta. Dr. Egon Horak - (2-4) Andean Chile.